The idea for Barkley Manor was born when Dudley, my Retrodoodle / first child (yes first in line for treats as always) made it quite clear that other dogs were way more interesting than me. Doggy daycare didn’t exist here at the time, so with a mix of excitement, and crossed fingers, we launched into our first facility in 2007 and proudly committed to a ‘cage free, off leash School for Dogs’ with two rubberised floor play spaces - yep for Big and Small! However, this simple little venture was destined to grow, and a chance lease of an adjourning building gave us the space to make Tiny Tots, a Puppy Room, and our grooming facility come to life. After many years dreaming and searching I finally found the perfect 'country' addition to our City Park, a truly magical piece of land just 40 minutes North of Auckland’s CBD. Our very own 150 acres of pine forest, bush majesty, and a myriad of streams, ponds and waterfalls. It’s here our passion for 'free running' has truly been realised. Our School Bus (yes that’s right, a specially fitted school bus) delivers the kids to their private adventure playground - no leads, no collars, no restrictions! We offer a unique style of ‘home from home’ overnight stays and nature day adventures for our Barkley kids only - ensuring that they are always with people they know and that know them individually. A special place where the Barkley Manor family and friends can come together, enjoy each others company and be themselves in a beautiful country environment. Barkley Manor is about YOU and YOUR DOG, and the life you want to lead. Dudley and his brother Rory (a.k.a Numbnuts) think it’s about hanging out with their mates in the City, or charging around covered in mud at the Country Park… I’ll leave you to decide. While the statement that “all dogs are, by nature, pack animals” may be true, it does not automatically translate that all dogs are either highly social or desire to spend their days in a big group. What differentiates Barkley Manor is our commitment to get to know your loved one first - and then work out what suits you both best. Our purpose built City Park is designed with dog safety first and foremost - it has a unique mix of 2,000 sqm Indoor play space - with specialist rubberised flooring, 9 activity rooms and over 1000 sqm of outdoor spaces - with grass concrete and woodchip areas all connected for daily access to fresh air. Our Country Park, located just 40 minutes north, is set in 150 acres of dog wonderland - where the Barkley kids can explore pastures, meadows, forests, bush streams and waterfalls on Day Adventures or during a stay at our Overnight Facility. We marry the right playgroup with the right weekly schedule to create your puppy / dog’s perfect week. Those dogs that just love daycare can enjoy a full day of activities and learning with a group of likeminded friends. Our daily schedule aims to achieve the perfect mix of learning, mental stimulation and physical exertion - building healthier minds, stronger bodies and happier souls. Our Experienced Leaders will ensure your dog’s happiness and health are always top priority. For our more discerning dogs or those in development stages, such as puppies and mature kids, we have dedicated rooms and staff for quieter and more focused activities. This may mean a slower introductory process (e.g. for our shyer or older dogs) a set program of play, rest and training (e.g. for our younger puppies) or maybe a day training plus specialist care option for more specific needs such as Separation Anxiety or Stranger Danger. … and for parents it’s GUILT FREE too. Creating the perfect week for your dog whilst living a busy working life in the city can sometimes be a challenge - our aim is to not just make your life easier - but your puppy / dog’s life better. 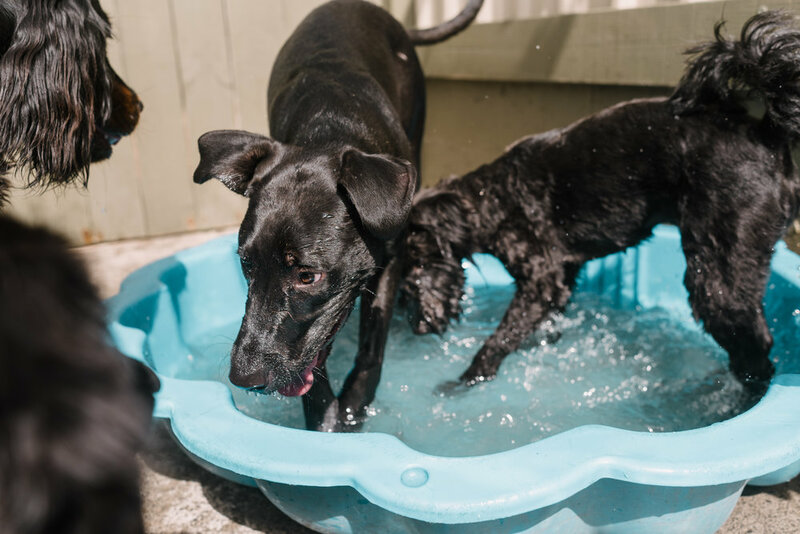 When you drop off your dog with us for daycare, training or adventuring you can trust that they are not only safe but are having a day full of fun and friends. At Barkley Manor it certainly is a dogs life. Of course you do, and we would love you to! The first step is completing your online profile so we can organise the most suitable day / time for your Meet and Greet. We will be in touch with any further details after we’ve received your application. We look forward to meeting you and your pup!